You look in the mirror and once again you’re reminded that your smile could use improvement. OK, maybe a lot of help if one or more teeth are missing, or they’ve gone downhill beyond the point of restoration. Don’t let your smile be an embarrassment. Professional dental implants from (Dental Office) can give you the smile and self-confidence you deserve. Our first goal at Riverside Dental is to complete a thorough evaluation of your unique dental condition. During consultation, our team of dental professionals will review results of teeth, gums and bone density exams. X-rays may be used to determine if bone structure is sufficient and where specific improvement is needed. Depending on your situation, several alternative options such as crowns or dentures may be recommended, or you could qualify as a candidate for dental implants. Dental implants are often the best choice for anyone missing one or multiple teeth due to defects, injury, gum disease or progressive decay. At Riverside Dental a professional general dentist will focus on diagnosis, treatment and restorative care. Through extensive education and training, our doctors specialize in the placement of surgical dental implants. A dental implant consists of three parts: a.) the tapered titanium implant post, b.) an abutment that’s a connector on top of the implant and c.) the custom-made crown that replaces and matches your natural teeth. The implant post serves as a replacement for the tooth root and is placed in the jawbone where it fuses with your natural bone to provide a solid foundation for replacement teeth. Implants are also used to secure a dental bridge or denture with multiple teeth. Because implants are placed and designed to match your natural teeth, they’re the closest you’ll get to natural, healthy teeth. The good news is you’ll be able to confidently eat, smile and many times even speak better as you enjoy your regular activities. Once the Riverside Dental team is satisfied that you have no underlying oral health issues, we will begin the dental implant procedure. 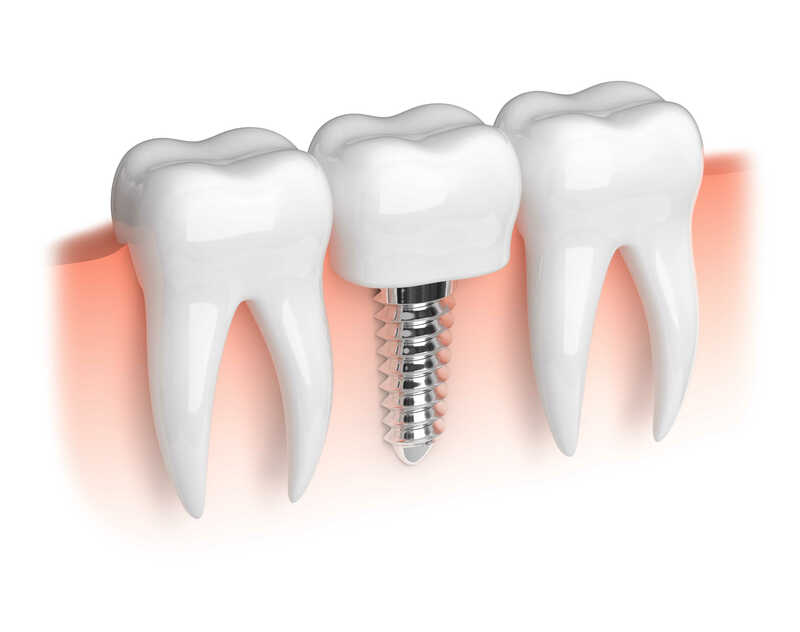 Most dental implant surgeries are a relatively minor process. Following a local anesthetic to alleviate any pain, a small pilot hole is drilled at the proper jaw site for placement of the dental implant. The implant screw widens the pilot hole and once in place is anchored to the jaw bone. This completes the first stage in a single sitting and the second stage requires a three to six-month period of healing while the implant anchors and fuses to the jaw bone. When the implants have properly fused and healed, Riverside Dental can now complete the second stage by uncovering the implant and place the abutment and custom crown restoration. Fitting and seating of the crown(s) can take up to two months, depending on your individual case and treatments. Once the implant is in place, maintaining good oral hygiene habits such as using a water pick is recommended to ensure the same long-term success as a natural tooth. FACT: Teeth restored with dental implants can’t get cavities, but brushing, flossing and checkups are still needed.